Are you new to bread baking? 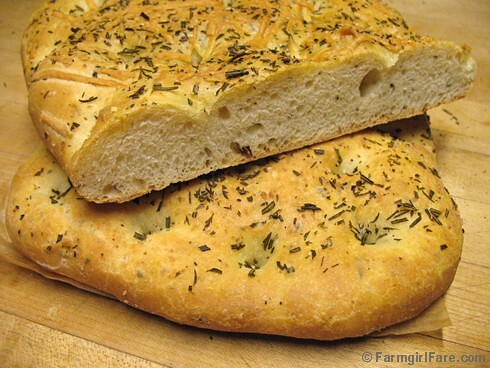 This scrumptious focaccia is a great place to start, and so is my easy pizza dough recipe. My popular Farmhouse White is a basic white sandwich bread that's perfect for beginners. You might also find my Ten Tips on How To Bake Better Artisan Breads at Home helpful. Homemade focaccia goes with almost everything—or just enjoy it alone. Focaccia is a delicious, easy to make, versatile Italian flatbread that for some reason I had never made—or eaten!—until just a few years ago. I tried my friend Stephen's rosemary focaccia recipe while working on an article about bread and fell in love at first bite. Basically a cross between a thick pizza crust and bread, focaccia makes fun burgers or sandwiches but is also nice eaten on its own or alongside a meal. There are countless focaccia flavors and toppings, from the basic olive oil and sprinkling of salt variety to complicated tomato, onion, potato, herb, vegetable, and cheese topped versions that turn it into more of a thick crust pizza. I love this simple rosemary rendition, especially as a 'bun' for lamb burgers. Stephen warned me that focaccia purists may scoff at his quick recipe, which shaves hours off the traditional resting times, but I couldn't stop eating it. The olive oil gives the bread a nice texture and pleasant taste. I reduced the yeast from four teaspoons to just one and added a little dry white wine to the dough, but you can always substitute more water instead. The optional sprinkling of Pecorino Romano or Parmesan on top adds flavor and looks pretty, too. Freshly picked rosemary is a wonderful little luxury. We had a huge rosemary bush in our Northern California backyard when I was a kid, but my attempts at growing it here in Missouri over the years have been pretty disappointing. I managed to kill two more plants this year, but I haven't given up—rosemary goes too well with lamb and it costs too much to buy those little 'fresh' packets at the store. Want to try growing your own rosemary? You might find this post on my kitchen garden blog helpful: Herbs In and Out of the Garden: Tips for Growing & Using Rosemary. Are you a fellow focaccia fan? What's your favorite way to make it or enjoy it? If you've written about focaccia on your own blog, you're welcome to include a link to your post in your comment. With cheese on the left, no cheese on the right. Stephen mixes his dough in a food processor, but I found it easier (and safer for my fingers) to simply knead it by hand. I can fit two ovals—but not two rounds—on my rectangular baking stone at one time. 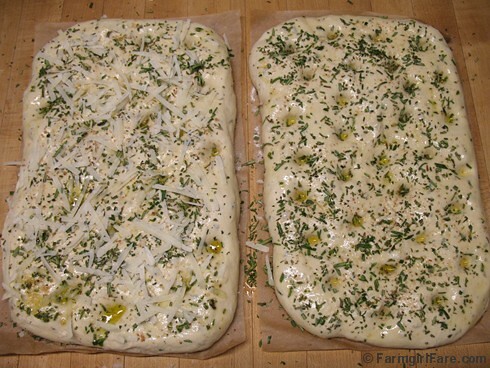 If you can only bake one focaccia at a time, set the other one in a cool place or in the refrigerator while the first one bakes; or you can always cut the recipe in half. If you don't have a baking/pizza stone (they make the best pizza and bread! 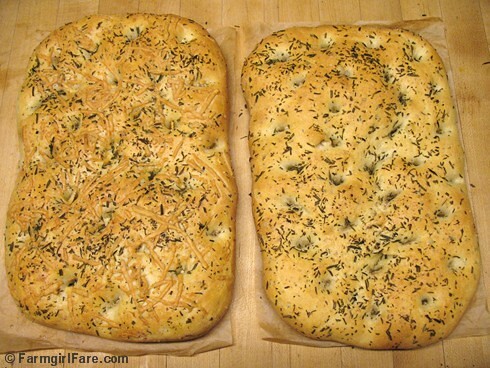 ), bake your focaccia on a heavy duty baking sheet. I've been using the heck out of some of my commercial rimmed baking sheets for 20 years for everything from baking scones to roasting Brussels sprouts. If you bake a lot of pizzas, focaccia, and other free form breads, a pizza peel makes loading them in and out of the oven a breeze. I use both wood and metal peels in various sizes but find the largest ones to be the most useful. Forming your bread or pizza on a piece of unbleached parchment paper will keep your dough from sticking to the peel. Just slide the dough and the parchment right into the oven. I also line my baking sheets with it. Combine 4 cups of flour and the yeast in a large bowl. Stir in the water and mix until a soft, sticky dough forms, adding a little more flour if necessary. Cover with a damp tea towel and let rest 20 minutes. Mix in the olive oil, white wine (or extra water), 2 Tablespoons of the rosemary, and salt. Stir in enough flour to make a soft dough. Turn the dough out onto a generously floured surface and knead for 7 to 8 minutes, sprinkling with just enough flour as needed to keep the dough from sticking to your work surface and hands. Place the dough in a food grade, straight sided plastic container with a snap on lid and let it rise until doubled, about 1 to 1½ hours. The ideal temperature for rising bread dough is 70° to 75°F. I check the temperature of my dough and ingredients using a $5 instant read thermometer. Cooler is fine; it'll just take a little longer and your bread will taste a little better. Scrape the dough out of the container onto a lightly floured work surface and divide it into two balls. Place the dough balls on pieces of unbleached parchment paper and flatten each one into a disk or oval about 1/2" thick. Generously drizzle the dough with olive oil and use your fingers to spread it evenly, then dimple the dough all over with the pads of your fingers and scatter the remaining 2 Tablespoons of rosemary and the Pecorino Romano over it. Cover the focaccia with a damp tea towel or plastic wrap and let it rise for about 30 minutes, or until the dough springs back slowly when you press a finger into it. Slide the focaccia onto the hot baking stone (I use a pizza peel) and bake 10 minutes, then lower the temperature to 375° and bake for another 15 minutes, or until the crust is golden. Cool on a wire rack 5 to 10 minutes before serving. Focaccia is best when eaten the same day it's baked, but it freezes beautifully. Still have more flour and yeast left? There's a category devoted to yeast breads in the Farmgirl Fare Recipe Index. © FarmgirlFare.com, where Farmgirl Susan shares recipes, stories, and photos from her crazy country life on 240 remote Missouri acres—and life revolves around baking bread. I've made focaccia with my baking mix before and it turns out pretty good but never the yeast variety. As much bread as I bake you would think I would have tried it by now! LOL!! Yours looks amazing and I'm inspired to give it a try! This is just what I was in the mood for but didn't realize it yet! Thanks for posting this! It looks really tasty - and the lamb burger is making my mouth water! This looks delicious! I love a crispy on the outside foccacia and can't wait to try this. Thanks. I have never made Fococcia and this looks amazing! I imagine it to be super fluffy and herb-y. I am going to add this to my must make list! One day, one day I will really try to make bread. On Days when I have an appointment with my Rhumetologist in Fairhope AL..I like to stop at the Fairhope Health Food store. Next door is the SunFlower Cafe...They serve most of their sandwiches on the fococcia flat bread or in vegetable wraps or Pita. All made right there in their Sunflower Kitchen...That is where I got introduced to alternative ways to have a sandwich. I did not realize that you could make your own until I read your site this morning.. I had so much fun making focaccia today. I love baking bread but never tried Focaccia. Your recipe sounds so easy and delicious...this is going on my 'to bake' list! I love all your posts... but I love the ones about making bread especially much. Your passion for it shows through in your beautiful writing. What a fun comment by annonymous, whose foccocia turned out in the shape of a heart! How appropriate! I (mostly) followed this recipe the other night and the result was delicious! I reduced the amount of rosemary (which I do not recommend doing) and added caramelized onions to the rosemary and cheese on top (which I do recommend doing). This was definitely easy to make and a delicious addition to our spaghetti with meatballs! I'm so glad you had first time focaccia success! I love that it ended up in the shape of a heart - and that you want to send me a photo. If you look at the top of any page on this site, just under the Farmgirl Fare header, there are some navigation tabs, and one of them says CONTACT and includes my e-mail address. I'm so happy your focaccia was a hit! Thanks for taking the time to come back and report. The caramelized onions sound like a wonderful addition! This bread is sooo delicious and easy to do! We had the first loaf with roasted chicken and yams (the first of the season- mmmmm!). I froze the second loaf even though we were going to eat it the next night (with split pea and potato soup)- it was still wonderful. I thawed it and popped it in the oven at 375 for 6 minutes...thanks for a great recipe, will be making more for sure! Love this recipe...well, love most ANYTHING that includes rosemary. I am so excited to find your blog! Love your recipes! I always wanted to make breads at home! I'm going to Le Cordon Bleu in Seattle and have to make something containing rosemary w/the things I have on hand at home. this is SO happening! :) (ps I already religiously make the farmhouse white bread :) so I trust your recipes XD thank you for being awesome! I'm not sure what the problem is. You might try reducing the length of the second rise, in case the yeast has been exhausting itself before the bread goes in the oven - and there isn't enough oomph left in it to create that burst of 'oven spring' when the dough hits the blast of heat. To find out if this is the problem, simply put one bread in the oven first, then wait 5 or 10 minutes and put the other one in and see which one comes out better. I have followed this recipe twice since finding it, using all purpose flour and fresh rosemary from our garden and it has turned out perfect each time! Never had much luck with bread before, thank you so much! I have made this recipe so many times and it comes out perfect every time. Gotta love a consistently superb recipe. I do not have a baking stone so I just use a preheated baking sheet. I also have been known to slice it in two and fill it with italian sausage, mozza cheese and fresh basil leaves. Wrap it in foil and stick it back in the oven for a couple minutes. It is to die for. So here I am back again to make it for my husband who is crazing this on a cold snowy Canadian day. I'm so glad you and your husband are enjoying this recipe! 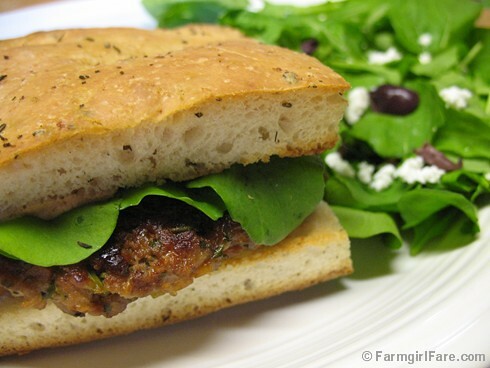 And your cheesy Italian sausage focaccia sandwich sounds fantastic. I'll definitely have to try it with some of my easy homemade Italian sausage. Thanks for the delicious inspiration!